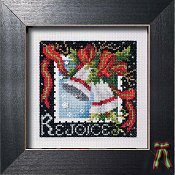 Navigate: StoreFront / Stoney Creek Cross Stitch Charts & Patterns / Pattern of the Month / November 2015 Pattern of the Month "HO HO HO...Snowman"
Stoney Creek's popular Pattern of the Month continues with the November 2015 design "HO HO HO...Snowman." 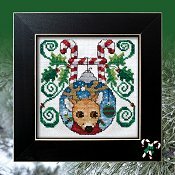 We stitched the design by itself on 14ct Aida and framed it in a 6x6 Candy Cane button frame from Stoney Creek, and also stitched all three designs together on 18ct Anne Cloth and have it displayed as a banner with a Christmas Tree fabric holder. 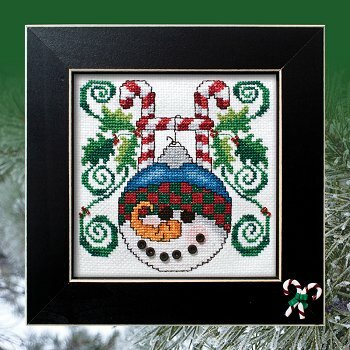 The Snowman face also makes a darling ornament when stitched on 14ct or 28ct over two threads and finished with a 3" round finishing form! 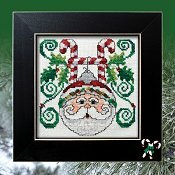 Stitch count for "HO HO HO... Snowman" is 70w x 71h, approximately 5" x 5" on 14ct. 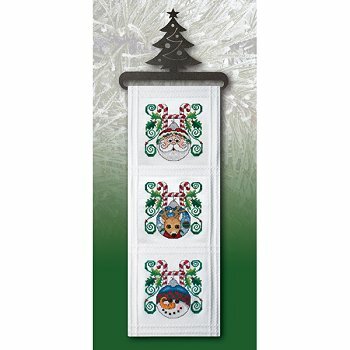 DMC colors in “HO HO HO...Snowman” are B5200, 415, 701, 704, 762, 777, 813, 814, 825, 826, 3371, 3818, 3831, 3853 abd 3854. 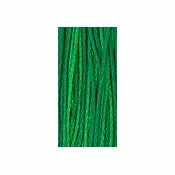 Beads and specialty threads used are Mill Hill beads 03049 Rich Red, Glissen Gloss Rainbow Blending Thread 901 Silver and Weeks Dye Works 2173 Envy (2 skeins if stitching the whole series) (DMC sub 701). 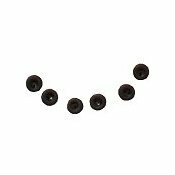 The design is embellished (optional) with six handmade dark brown simple buttons. 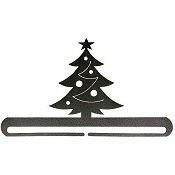 *Please see related products below for specialty threads, beads, buttons, small and large fabric cuts, frame and fabric holder. 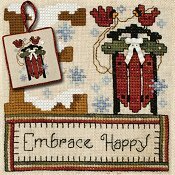 June 2014 Pattern of the Month "Rejoice"
May 2013 Pattern of the Month "Embrace Happy"